Now that spring is finally here, it’s time to go out and explore the Netherlands – especially considering that as an international student, it might be your last few months in the country. If you’re feeling adventurous, and don’t mind a long three-hour train journey, Maastricht is a great city to visit, and here’s a list of things to see and do once you’re there. Buy freshly baked cakes and bread at the Bisschopsmolen. Tucked away in the centre of the city is one of the oldest windmills in the Netherlands, and the first 100% spelt mill in the country. If you’re looking for a place to rest your legs they have a café inside; alternatively, if it’s a nice day why not buy something from the bakery and sit in Onze Vrouwekerkplein around the corner? Everything they make is made from 100% spelt and is delicious – a freshly baked gevulde koek is only €1.50, and you can even buy packets of their traditional flour mix to try your hand at baking your own bread at home. Walk along the city walls. On the east side of the river Maas, a little to the south of the main city centre is Maastricht’s city park – an open area of pleasant greenery perfect for a picnic. Opposite the Hellpoort – the only surviving original gate to the medieval city – you’ll find the remains of the old city walls. The walk along the walls takes you alongside the city park until Henri Hermanspark, another peaceful spot to sit and relax. Go book-shopping inside a church. From the outside, there’s nothing different about this 13th-century gothic church, but wander inside and you’ll find a grand bookstore. Boekhandel Dominicanen sells both Dutch and English first- and second-hand books, as well as textbooks and non-fiction. At the back of the church, there’s a café where you can read your new buys under stained glass windows. Take a walk to Fort Sint Pieter. This early-eighteenth-century fort is about a 25 minute walk out of Maastricht, but definitely worth the effort. As you start to leave the city centre, the ground begins to rise, and you suddenly find yourself admiring the city from above. At the top of the Sint, Pietersberg lies the fort, an intimidating stone fortress that looks like it’s straight from a Game of Thrones set. Since it is a national monument, you’re free to wander around the grounds; if curiosity gets the better of you, a tour of the inside of the fort costs €6.75. The fort is actually connected to underground caves in the Pietersberg, and you can also buy a combination ticket for the caves and fort for €10.40 – a bargain. View of Maastricht from the Fort Sint Pieter. Admire the river Meuse from the Sint Servaasbrug. This Roman bridge has been called the oldest pedestrian bridge in the Netherlands, and on a good day offers a stunning view of the eastern and western parts of Maastricht. Make sure to walk back to the central station over the bridge and capture the beauty of Maastricht over the river. View of the Sint Servaasbrug. If you are considering a trip to Maastricht, NS Spoordeelwinkel, the place for cheap train tickets, are currently offering a return ticket to Maastricht and a coffee/tea and waffle for €19. I graduated from Goldsmiths in July 2016, and just a week later moved to Leiden to start my Masters in American Studies. This was a huge change from living in the bustling metropolis of London for 3 years, but a very welcome change nonetheless! Leiden also seemed the ideal place to study America, considering it was the place the Pilgrims first took residence from England before setting off for America. So far it’s been great meeting a host of other international students from around the world (including many others from the UK) and I look forward to documenting my time here through writing for The Leidener. 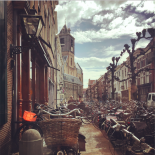 This entry was posted on May 4, 2018 by Abigail@TheLeidener in Culture, Leisure, Living in Holland, Nature, Student Life, Travel, Uncategorized and tagged International, international student, leiden university, Limburg, Student, study abroad, the netherlands, wanderlust.